It’s not my opinion, it’s Science! 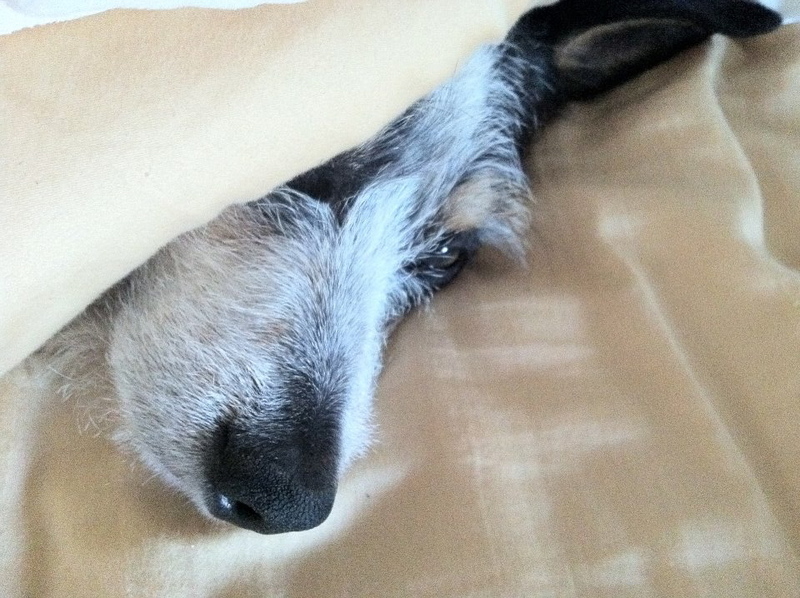 The Rev Pete Turner on Acting ugly…. The Rev Pete Turner on Finding joy…. Our first Strong to the Finish class will be on Saturday, April 12th @ 9:00 am. We were able to get most of the weights needed for this class but still need kettle bells if you happen to have one lying around. Also, please be sure to bring your own yoga mat for ab work! Courage. That’s what I’m going to need tomorrow morning. Lots and lots of courage. I’m doing something that I’m always afraid of doing – I’m going to a new exercise class tomorrow. It’s called BodyPump and I know that I can do the work but I’m afraid of doing it in front of other people. That’s the problem, isn’t it? I see it as doing the work in FRONT of and not WITH. If I’m doing it WITH them then I won’t fail or fall short but if I’m doing it in FRONT of them then I can fail miserably. I guess it’s not courage that I need. It’s perspective. Jesus said the truth will set you free. And the truth is that this is just a class and the only failure is not giving it a try. This class does not define who I am as a woman, an athlete, or as a potential friend unless I give it the power to do so. God, please give me your perspective on this and all areas of my life. Please don’t let me limit myself because of how I see myself but let me live life to the fullest because that’s the gift your Son has given me…. When Hank and I are traveling together we try to take our dogs with us. Now these are desert dogs and are used to rocky soil, sagebrush, rattlesnakes, and jack rabbits so on these trips they discover new things like grass, water, sand, tall trees, dead possums, squirrels, and much more. Until last night all of their new discoveries were filled with opportunities for adventure. But last night they experienced their first PCB thunderstorm with the night skies filled with lightening and the sound of thunder roaring across our little beach house. It would seem that a storm like this would terrify these small dogs from the desert but they slept right though it all. I know why they were able to sleep through the storm. It’s because they knew they were safe. They knew that if there were any danger to them at all then we would have come to take them out of their kennel and put them in bed with us. They trust us completely. Maybe we’ve been lacking trust in the one who keeps us safe during the storms. Maybe, just maybe, we can begin to believe that if there is any real danger to us then God will come and put us on his lap. And in knowing that we can sleep through the thundering and the lightening. One of the best parts of this lenten fast is trying to find new recipes that are delicious, filling, and protein packed. Today I made Cabbage Leaves Stuffed with Chickpeas, Raisins, and Spices from my Vegetarian Times Complete Cookbook (recipe below). It was so good that Hank said that it was a definitely, definitely make again…. I think it’s really important to try new foods as we are on your quest to a healthier life. We get so used to eating the same old, same old thing that we rarely experiment with new recipes. And, let’s be honest, we’re often too afraid to try something new at our local restaurants because we don’t want to pay for something we don’t like. So we find ourselves doing what we’ve always done — mindlessly eating foods that we know aren’t very good for us. During this fast, lest encourage each other to find a new recipe and make it! Let’s awaken our taste buds to more of God’s abundance and begin to take the enjoyment of our meals to a whole new level! When the water is boiling, add 3 teaspoons of the lemon juice and the head of cabbage. Reduce the heat to low, and cook for 10 minutes or until tender. Drain in a colander and set aside to cool. Heat the butter in a large skillet over medium heat until bubbling. Add the onion and carrots, reduce heat to low, and cook, stirring frequently until onion is soft. Add the reserved chopped cabbage and stir until it starts to wilt. Add the vinegar and stir well. Continue cooking until carrots are tender. Combine the onion mixture, cottage cheese, chickpeas, apple, raisins, remaining lemon juice, honey, and soy sauce. Mix well. Peel off cabbage leaves. Place filling in the middle of the leaf, fold into a package. 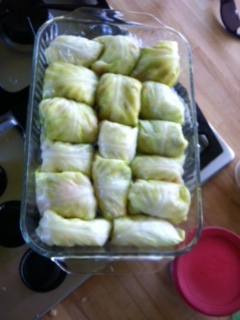 Place cabbage roll seam side down in a 9×13 baking dish. Repeat the procedure until all the filling is used. Pour 1/4 cup water in the baking dish and cover with foil. Bake for about 20 minutes or until heated through. Remove from the pain, and let sit covered for 10 minutes. Serve warm topped with plain yogurt. Eating well should be an adventure not a lesson in drudgery! And the internet makes it easier to take our own culinary adventure each and every day if that’s what we want to do. The other day I googled forbidden/black rice and found this wonderful recipe. I hope that you enjoy it as much as we did! A recipe from Love & Lemons…. Whisk together dressing ingredients and set aside. (You can take a taste but remember that it might seem a little strong – it’ll become more tame once it’s on the brussels sprouts and everything else). Heat a large skillet over high heat. Add a few teaspoons of oil. When it starts to sizzle add the brussels sprouts, cut side down (or as many as you can get cut side down quickly), with a few pinches of salt. Don’t touch them for a few minutes until the cut-side starts to turn golden brown (turn one over to check). Once they have a good sear, flip them over, add the broccolini and continue cooking until tender, but not mushy. At the very end, toss in the scallions. Transfer the vegetables to a large plate, let them cool slightly, then toss with a bit of the dressing. Taste and adjust seasonings. Toss the brussels sprouts & broccolini with the black rice, sliced avocado, mint, almonds, sprouts and sesame seeds. Taste & toss with more dressing. Serve warm, and with extra lime slices and more sriracha if you like. Vegan/vegetarians: sub soy sauce or tamari for the fish sauce, but add only 2 tablespoons, not 1/4 cup. (you can always add more, to taste). Feel free to roast your brussels sprouts & broccolini in the oven if you prefer. 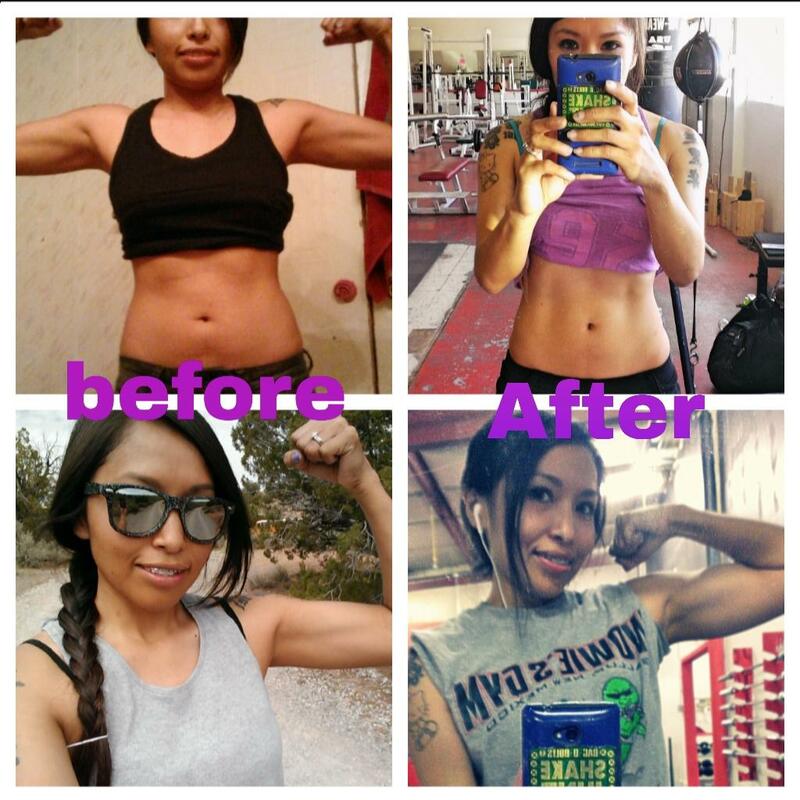 One of my friends at the gym, Cecely, began her workout program last October or so and has made some tremendous gains! She’s like an ant and can lift her own weight! And, the best part, is that she does it all with grace, humility, and kindness to spare! Hank has suggested that we fast during this season of Lent. I’ve let him decide the fast that he thinks is best for us and I’ll do my best to prepare the foods that we’ll be eating. But you should know that I’m not very good at fasting. I begin with the best of intentions telling myself that I am seeking God to clear away the debris and clutter of my soul so that I can become the spirit-fillled, spirit-led woman that He has created me to be. I start out with a right heart until I start seeing that I’m actually losing weight. Then I become consumed with the weight loss instead of being focused on the Father who wants to clear away all that hinders me so that he can bless me with that abundant life His son promised me. And, just like that, I’ve thrown my spirit, soul, and body out of alignment. My body becomes my god and fasting is my sacrifice to myself. God has clearly said time and time again that He will not allow us to have any other god before Him and yet I so easily fall into a pattern of self-worship. If you are like me, do you find it impossible to keep your spirit, soul, and body in proper alignment of when you are so consumed with your weight? Maybe the answer lies in feasting instead of fasting. Our appetizer should be our praise, our main course must be the Word, and worship is our sweet dessert. Like breakfast, this feast will be my most important meal of the day. I will set aside time each day to feast in God’s presence beginning with a song that makes me sing out loud, read the Word, and then I’ll end with worship. I am going to change my focus from the fast of denying myself food to the feast of being in God’s presence. This challenge will align my body and soul with my spirit. In the past, I’ve set out with the right heart but have quickly been thrown off course and have ended up feeling as if I’ve disappointed God and Myself. By feasting with the Father I will discover that food can never satisfy the desire of my spirit to become one with the Father. I will also be reminding my body that it is not my god and telling my soul once again that I will only worship the Lord my God. Would you consider joining me on this Lenten Feast?